The value of the Commonwealth of Nations was again evident recently as its perseverance paid off in Fiji. After eight years, Fiji returned to Commonwealth membership last week following the decision by the Commonwealth Ministerial Action Group (CMAG) that “credible elections” had brought to government a political party supported by the majority of the people at the ballot box. Of all the Commonwealth’s 53 member states, Fiji has had the most volatile relationship with the association. Over the 44-year period since the country became independent and joined the Commonwealth, it has left or been suspended four times. Yet, it returns happily to the fold once its government has been adjudged to be back in compliance with the Commonwealth’s core values of democracy and the rule of law. Remarkably, Commodore Voreqe Bainimarama -- the man recently elected to head the government – is the same person who, for the last eight years, ruled the country after seizing power in a military coup on Tuesday 5 December 2006 from then Prime Minister Laisenia Qarase. It was Fiji’s fourth coup in 20 years. CMAG then suspended the country from the Commonwealth, demanding immediate restoration of constitutional rule and democratic government. 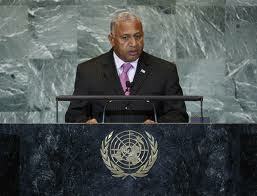 Bainimarama kept the Commonwealth waiting for six years until the beginning of 2012 when he announced plans for elections. Another two years went by before the elections were held on 17 September 2014. Throughout the eight-year period, Commonwealth countries and the Commonwealth Secretariat maintained lines to Bainimarama’s regime. But while the role of individual Commonwealth countries, particularly Australia and New Zealand, in trying to influence a return to democracy in Fiji is significant, it is the secretary-general’s ‘good offices’ role that represented the collective Commonwealth position and effort. The ‘good offices’ role of the secretary-general started in a limited way under the first person in that office, Arnold Smith; it was expanded and implanted in the work of the Secretariat by the second secretary-general Sir Shridath Ramphal, particularly over the end of white rule in Southern Rhodesia, its transformation into majority rule in independent Zimbabwe and the struggle against apartheid in South Africa. Since then secretaries-general have employed ‘good offices’ roles by their own behind-the-scenes diplomacy or through specially appointed envoys. “Good offices” were also used following coups in Sierra Leone, The Gambia, Pakistan and Nigeria. Even in countries where there was not a coup, but political party rivalry threatened the democratic process – as in Guyana in the lead-up to what turned out to be a peaceful general election in 2006 – the ‘good offices’ role played by Sir Paul Reeves, the then Secretary-General’s envoy, was crucial as a facilitator of political dialogue that otherwise might not have taken place. In each case where ‘good offices’ were employed the objective was to encourage military regimes, governments or political parties to adhere to democratic principles. Fiji especially pre-occupied the ‘good offices’ role of four secretaries-general from 1987 under Sir Shridath to 2014 under the current office holder, Kamalesh Sharma. In 1992, Lt Colonel Sitiveni Rabuka, who had staged two coups in 1987, turned to Secretary-General, Emeka Anyaoku, for help to establish a new constitution that the Fijian population would broadly accept. Anyaoku appointed Sir Paul whose guidance led to a new constitution and Fiji’s readmission to the Commonwealth. Three years later, Fiji was again thrown into disarray through a coup and CMAG immediately suspended it from Commonwealth membership. Secretary-General Don McKinnon appointed Justice Pius Langa, the former vice-president of the Constitutional Court of South Africa, as his special envoy. After much hard work, the 1997 constitution was reinstated, elections held in August 2001 observed by the Commonwealth, and Fiji returned for a second time to full Commonwealth membership. Then, in 2006, Commodore Bainimarama struck, unseating the elected government in a bloodless coup and imposing military rule with himself as head of government. This occasioned Fiji’s suspension from the Commonwealth yet again. And, McKinnon turned again to Sir Paul who died before there was any progress from his second round of labour in Fiji. The present Secretary-General Kamalesh Sharma kept up links to the Fiji government, encouraged in this by the big Commonwealth countries in the Pacific, Australia and New Zealand, but also by Fiji’s smaller neighbours. Under pressure within Fiji and from neighbouring Pacific countries as well as the United States to hold free and fair elections, Bainimarama’s regime established another new constitution which became law in 2013. The new constitution was not universally applauded. Dissenting groups within Fiji and leading non-governmental organizations in the international community were troubled by it. But, it led the way for the Commonwealth Secretariat to become involved in pre-election arrangements and to observe the general elections held this year on 17 September. The efforts of the Commonwealth and successive Secretaries-General may seem to have been a great labour over a small country with a population of fewer than a million. But each of those people are entitled to live in freedom and associate through political parties of their choice. It may not have been the Commonwealth alone that ended eight years of unelected rule in Fiji, but the perseverance of the association did play an important role in ending the rule of the military junta and in the establishment of a broadly acceptable Constitution and a general election process. As Secretary-General Sharma said the election was “a critical step in Fiji's return to full democratic and civilian constitutional rule”. The Commonwealth stands out as the only multilateral organisation that penalises member governments that seriously or persistently violate its core values. It is also admirable for its continued engagement to uphold democracy and civil and political rights in its member countries – not always to the satisfaction of all, but with perseverance showed by no other multilateral organisation. As for Fiji’s return to the Commonwealth, the words of Archbishop Tutu resonate loudly when he said of South Africa’s readmission to the association after the fall of the apartheid regime: “It was the South African regime that left the Commonwealth, not the South African people”. The people of Fiji are better-off, in more ways than one, for being back in the Commonwealth family.